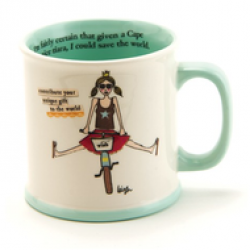 This mug is for the woman who is out to conquer the world. It says on the outside, "Wish" "Contribute your unique gift to the world." and on the inside, "I'm fairly certain that given a cape and a nice tiara, I could save the world!" Ceramic mug holds 15 ozs. Dishwasher and microwave safe. 4"